The Slimline range is designed for general-purpose applications and provides excellent performance in a compact size. Only high quality components are used in all chambers with the result they are highly reliable. SIMPLEtouch programmer is fitted as standard which makes chambers easy to use even for inexperienced operators. Slimline environmental chambers are available in a wide range of Temperature and/or Humidity ranges as well as internal sizes. LN2 (liquid nitrogen) cooled versions are available with ramp rates up to 10°C/min. 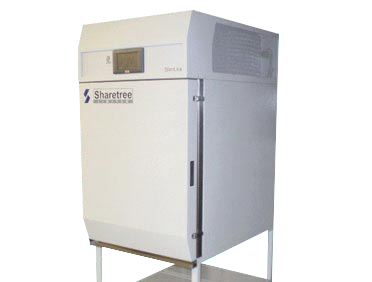 Slimline-LN temperature test chambers are designed for general purpose laboratory and test applications where small chamber size is important, and product loading is relatively low. Liquid nitrogen (LN2) is used for cooling; this is expanded through an evaporator coil to avoid any operator exposure to cryogenic temperatures and ensure maximum safety. An interlock switches the heating and cooling off when the door is opened. The nitrogen gas exhaust must be vented through an external wall to prevent oxygen depletion. the Slimline 450 model has a 0.7m2 footprint - large, lockable castors make moving the chambers very easy. air is drawn in to the centre of the rear wall, conditioned in the plenum before re-entering the chamber at the front through a grill by the door. such as small electronic modules, sub-assembly testing, etc. where good control at specific conditions is required. ranges of +180°C to either -40°C or -70°C are available. The Slimline range is renowned for is wide humidity conditions which exceed Area ‘A’ - the norm for most chambers in this category. no-maintenance capacitive humidity probe, for hassle free humidity testing. IEC60068 (Environmental Testing of Electrotechnical Products).